Brian D. Krebs, 44, residing in Milan, formerly of Sandusky, died Tuesday, July 31, 2018, in Fisher-Titus Medical Center, Norwalk. He was born in Sandusky on June 20, 1974. Brian loved hanging out with his family and friends. He is survived by his father, David Krebs, Cleveland, OH; son, Jacob; sister, Brenda (James) Hazelwood, Cleveland, OH; brother, Robert Krebs, Milan; and several friends. He was preceded in death by his mother, Bonita (Kesenich) Krebs; sister in infancy, Cheri; and paternal and maternal grandparents. 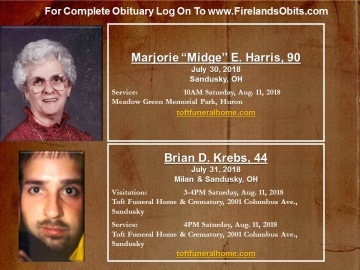 Friends may call on Saturday, August 11, 2018, from 3 P.M. until time of memorial services at 4 P.M. in Toft Funeral Home & Crematory, 2001 Columbus Ave., Sandusky. Inurnment will be in Oakland Cemetery.